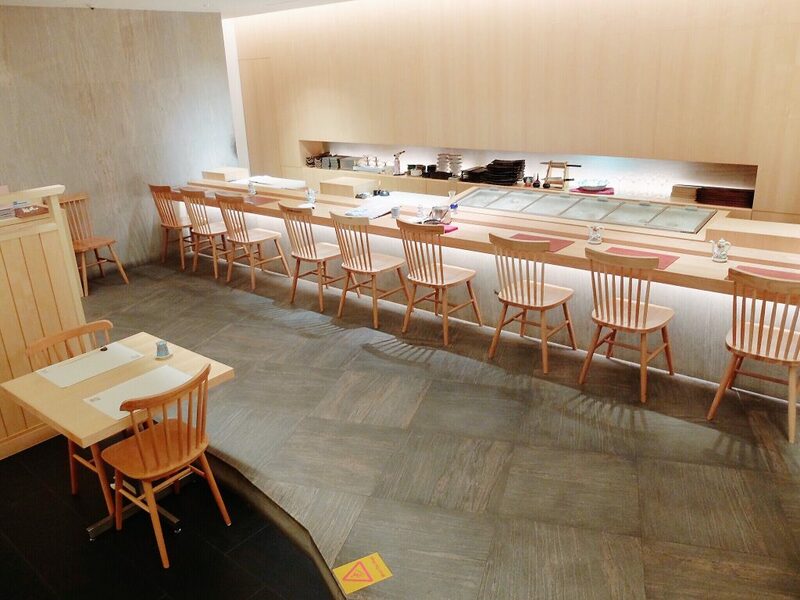 Sushi Jiro is one of the few fine, authentic Japanese restaurants in Singapore. They’ve been around for almost 20 years having been previously located Siglap. Now, they’ve shifted to the significantly more upscale Marina Mandarin Singapore hotel. 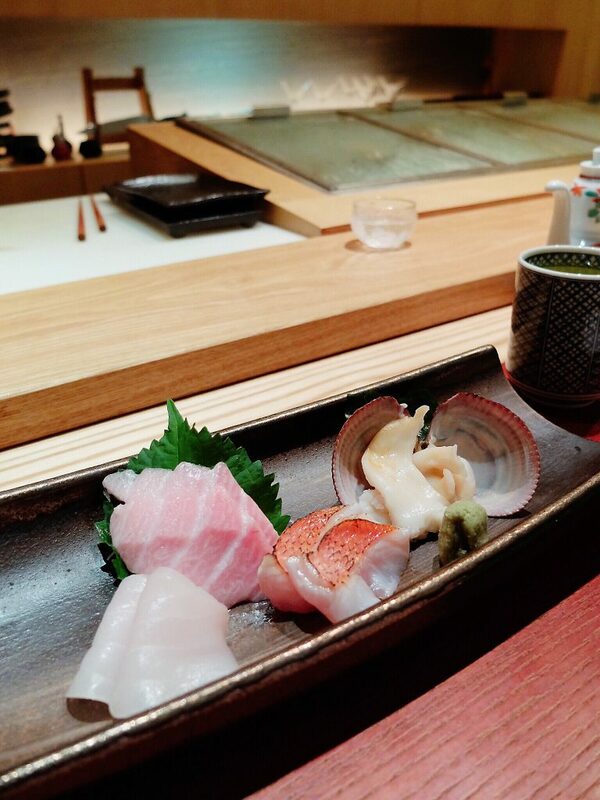 From the point I stepped into Sushi Jiro, I was actually pretty impressed about their attention to detail. I’m not even referring to the food yet. Everything from the decor, to the usage of wood elements, to the space-planning simply felt so symmetrical and proper. You really seldom see that kind of attention to detail in entry-level fine dining restaurants though, and points were immediately earned (well, in my head at least) for these! I flipped through the menu and instantly became super hungry. 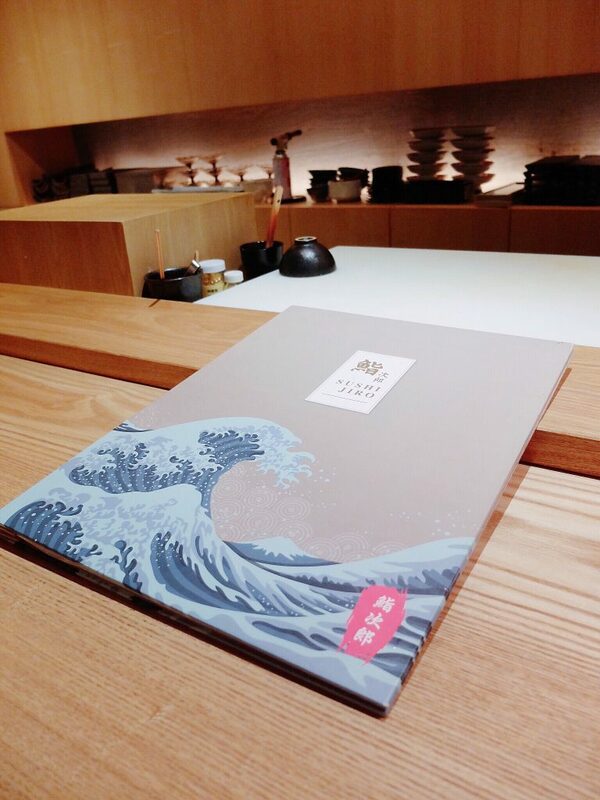 Sushi Jiro offers a wide array of authentic (duh) Japanese cuisine from set lunches for the everyday salaryman’s lunch break, to specially curated Omakase courses and a la carte dishes. 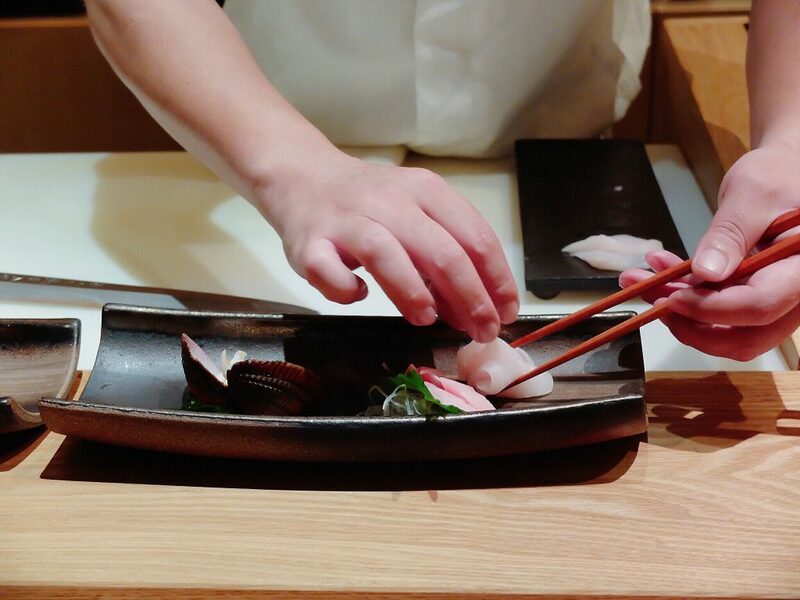 And that’s where the magic begins – the Omakase – specially curated by Chef Kenji Nakagawa. 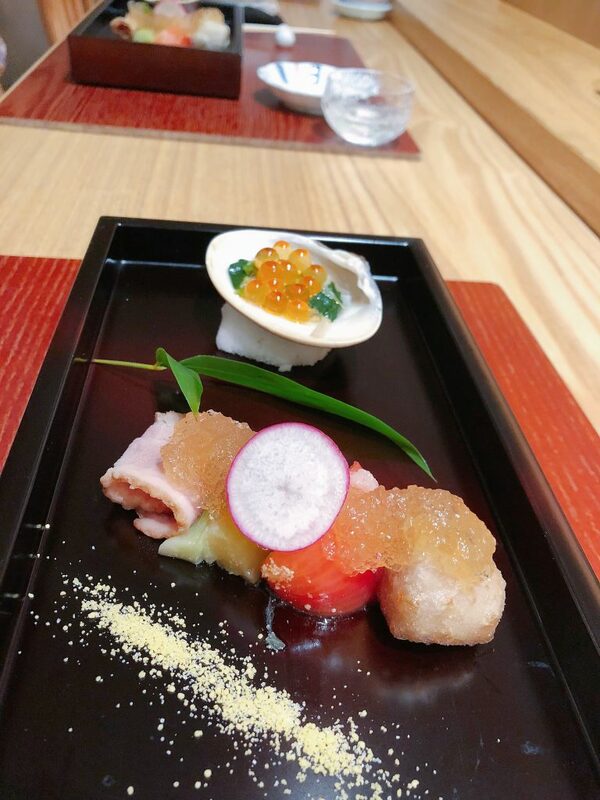 A few skillful strokes of his sashimi knife, and some plating later, the first starter dish was served! Sponge Mackerel with a side of Okra (or rather, normal locals like myself will probably know it better as “Ladies’ Fingers”) and a Cherry Tomatoes to go along. I promptly gobbled up the starter, and the tangy flavour, probably due to the tomatoes and the slight hint of dressing on this dish helps to stir up our appetite! Needless to say, the tanginess complimented the Sponge Mackarel pretty well. Then came the Calm Topped with Ikura (also known as Salmon Roe) & Spinach. 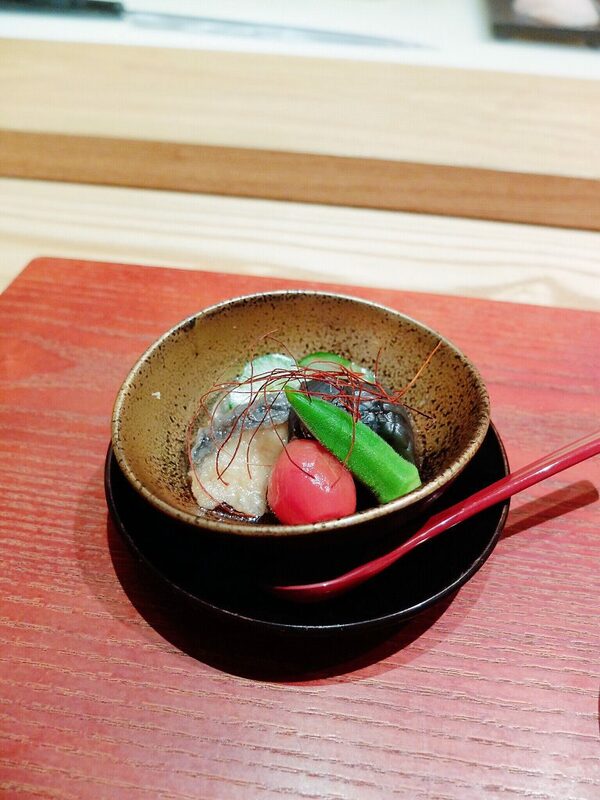 The spinach added a bit of texture to the Ikura when we slurped up the clam with it. One slurp – that’s all it takes to savour this beautiful creation. The Steamed Duck Roll with Dashi Soup Stock came with a little bit of yam and the “jelly” topping was actually the Dashi Soup Stock that was boiled down and reduced into jelly. 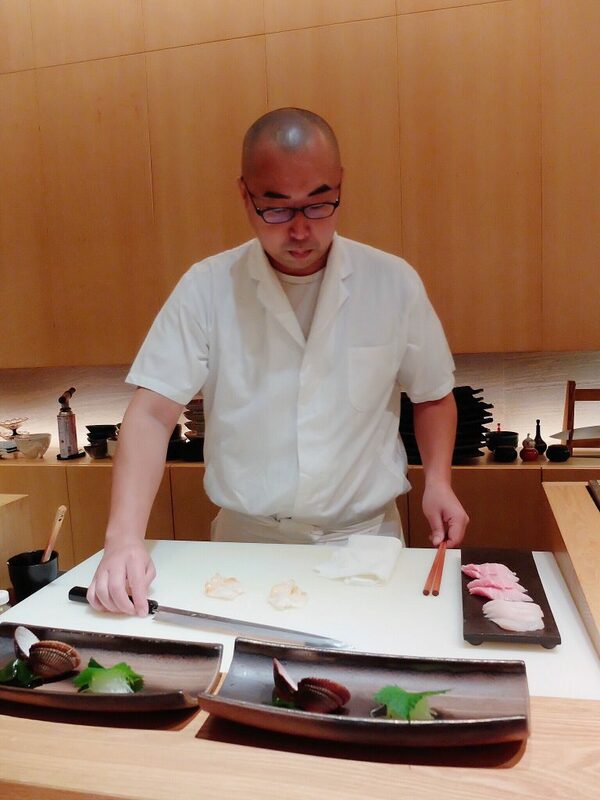 Here’s a shot of Chef Kenji Nakagawa who was pampering us with delicacies. 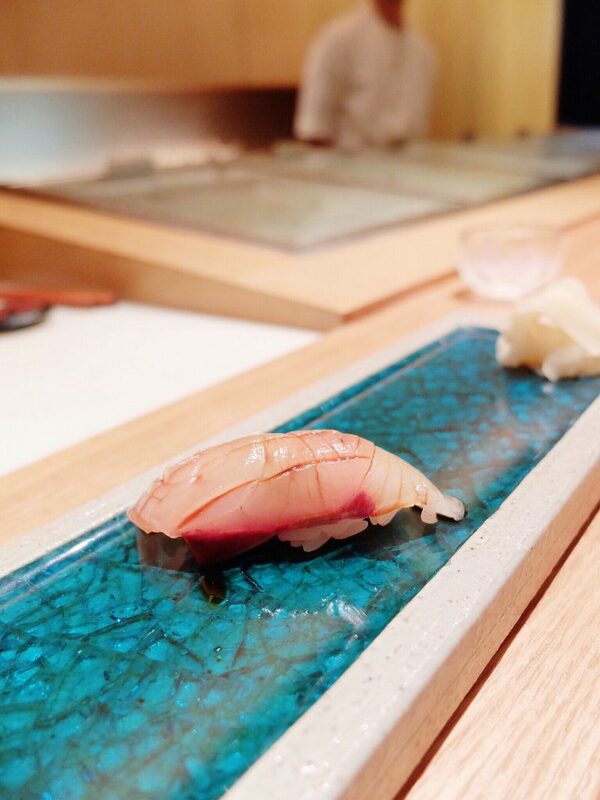 Next up – Seasonal Shellfish being plated? 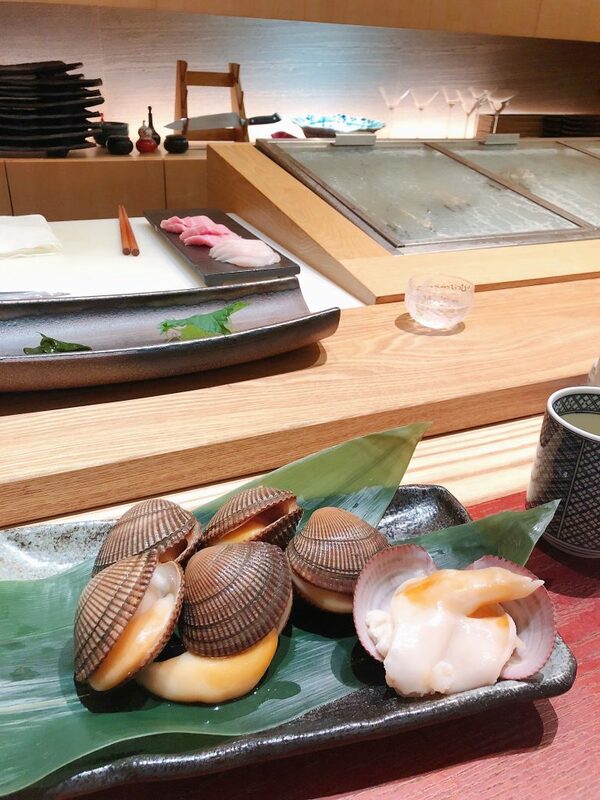 ..but first, let me introduce to you our seasonal shellfish of the day: Ishikagegai – also known as Orange Cockles. You can’t exactly get this all year round due to it being suitable for harvesting only at selected times of the year. These cockles are actually significantly larger than the ones you’re used to seeing at your neighbourhood BBQ stall. They’re actually about the size of a palm-sized pebble each! Behold, the third course today: Our mixed Sashimi Platter which comes with Skill Fish (a Japanese deepwater fish), Otoro, Golden Eye Snapper, and of course our Orange Cockles from above…. 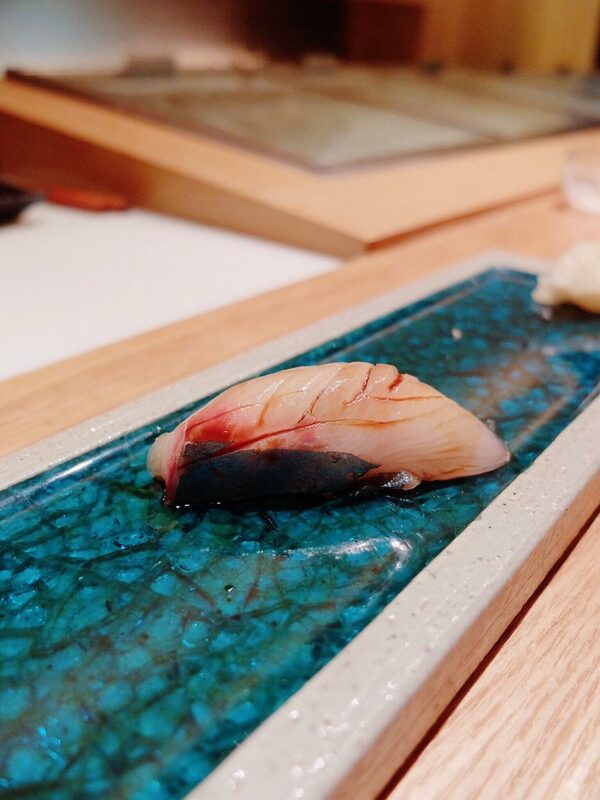 The texture of the Skill Fish was a little smoother than cod, and of course the Otoro melts entirely in your mouth. The Golden Eye Snapper was bouncy, and the Orange Cockles were probably the most pristine-looking cockles I’ve ever eaten! For our fourth course, we were served sea bass which was lightly cooked in dashi and topped with a mixture of seaweed and radish. Of course, I gobbled up the two slices almost as fast as the dish was placed on the counter! 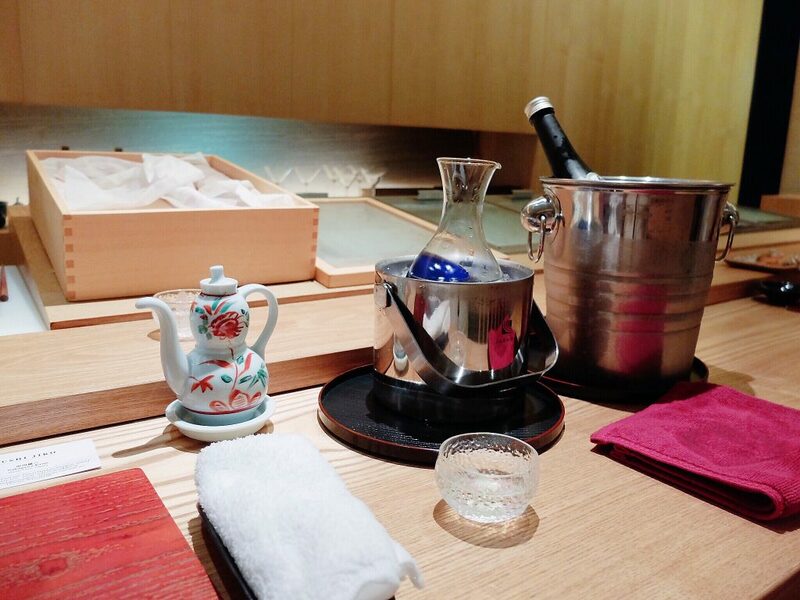 I would say the dashi really draws out the taste and freshness of the sea bass, and the topping mixture balanced out the taste of the fish’s skin. Wait… what? Is that.. No, it can’t possibly be! ..everything served together in a Martini glass?! Holy cow! This is hands down my new favourite “cocktail”. It’s made up of 100% premium ingredients as you could probably tell by now. 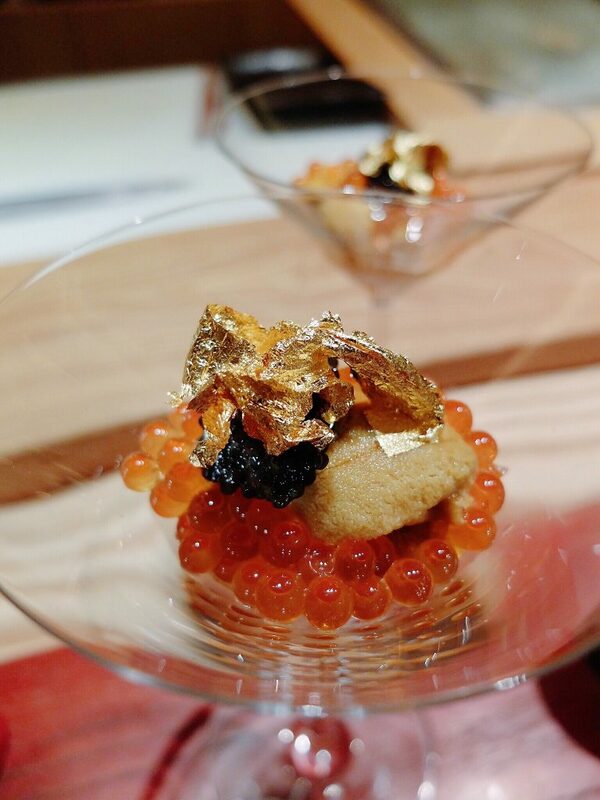 You get a really generous serving of uni as the base, layered with Ikura and topped with caviar and gold flakes! Basically, it’s one of those dishes that those Crazy Rich Asians would probably have for tea daily! 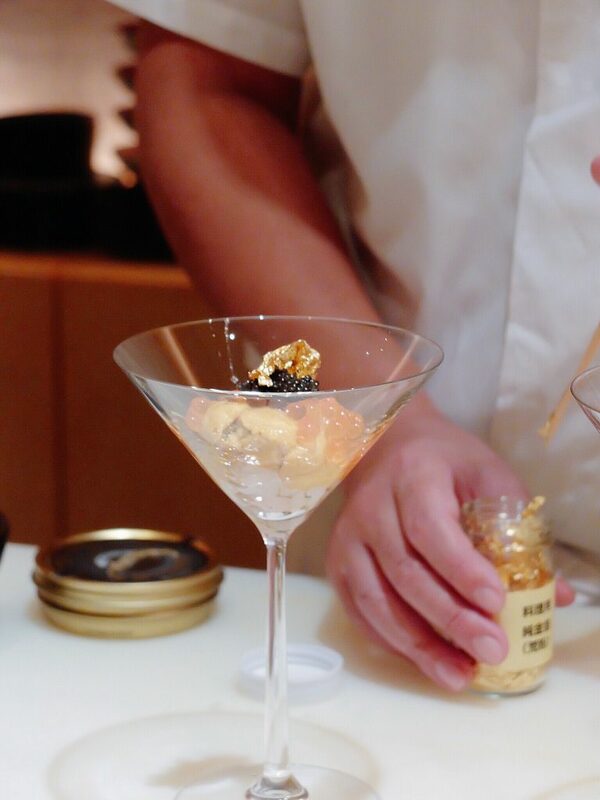 And yes, I know you’ve been dying to ask – the gold flakes are edible too. I thought what I saw was all I got…. until I got to the bottom of the Martini glass and realized that there was this huge, juicy Boton Ebi (sweet prawn) waiting for me to devour. Wah!!!! You know how the usual tempura you have at that takeaway sushi place is just made up of one shrimp with loads of flour and bread crumbs coated around it? 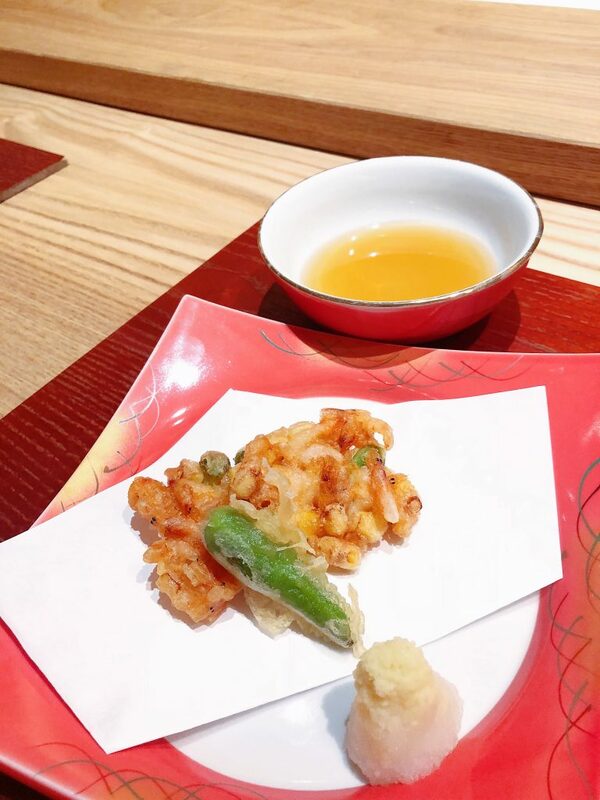 Look carefully, and you’ll see the hundreds of tiny shrimps mixed together with summer seasonal vegetables before being flash-fried and made into tempura! It’s actually a pretty healthy dish, too… well, there’s vegetables! 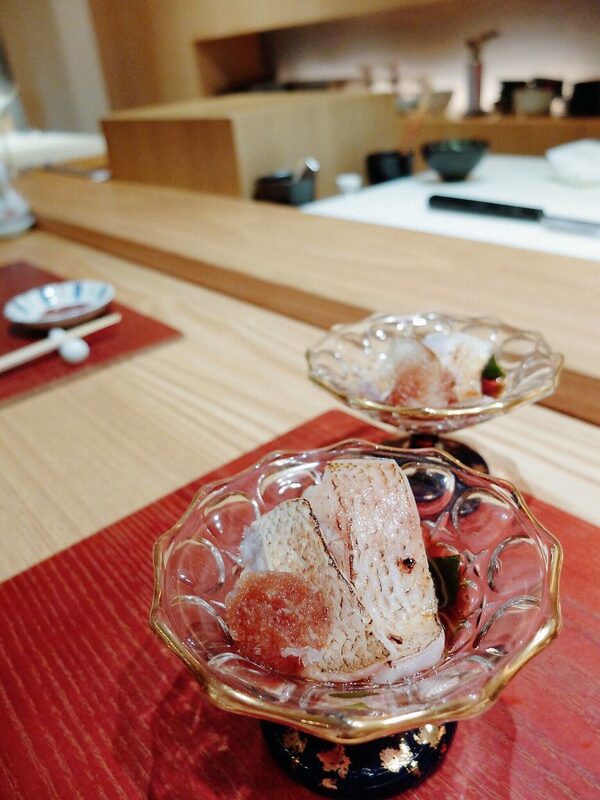 And then the 7th course landed on our table… Hokkaido Oysters! To be honest, I was actually pretty full by now. I thought I couldn’t eat anymore…. 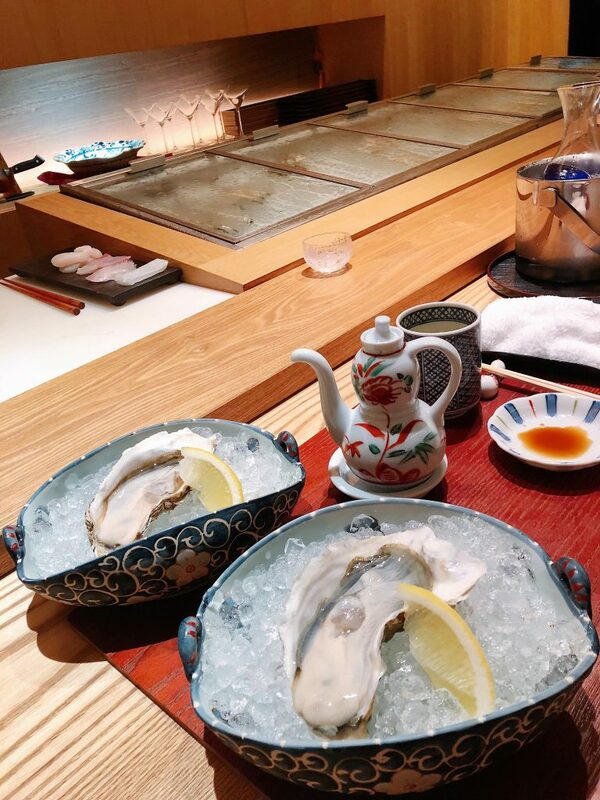 until we were served with these fresh, huge oysters from Hokkaido! When I say huge oysters, I’m actually dead serious about it. Each and every piece is almost the size of my hand! 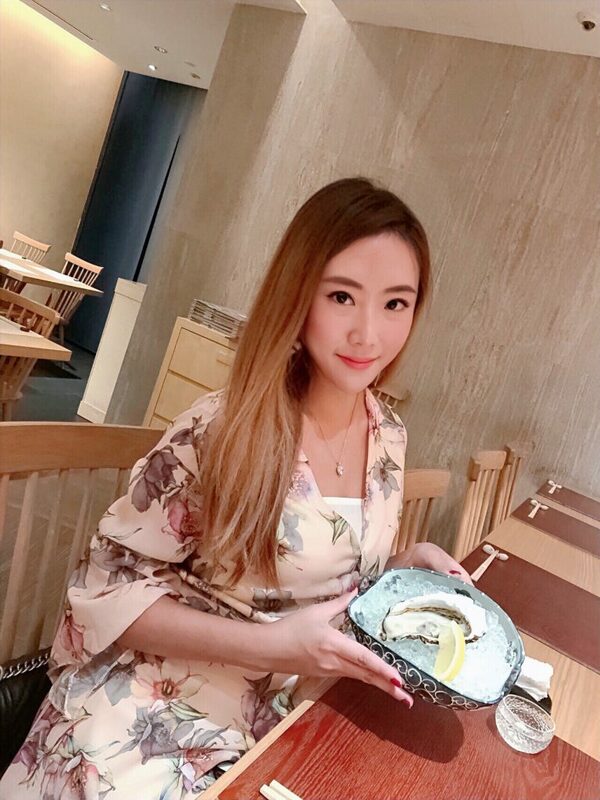 The soft and creamy texture of the oysters made me forget that I was so full and the hungry girl mode turned itself back on, again. To enjoy this delicacy, one simply has to just slurp! 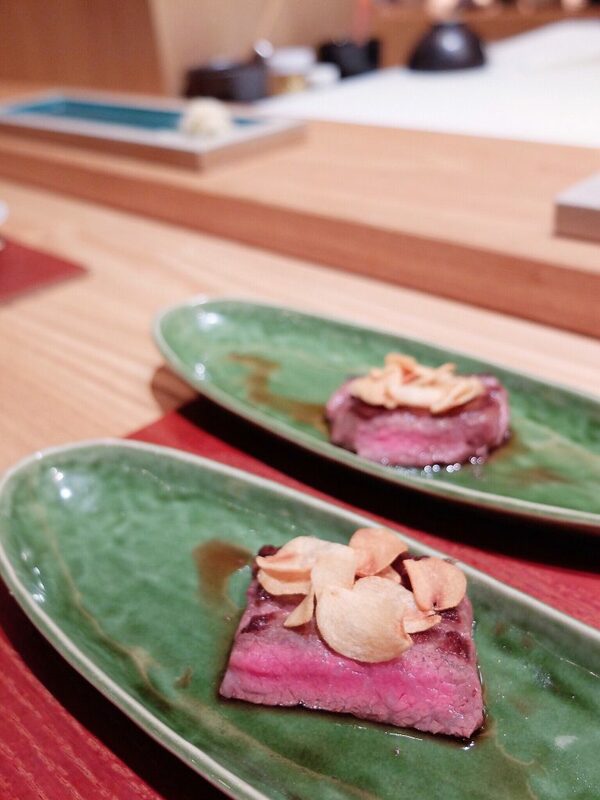 And then came the Lightly-grilled A5 Wagyu topped with Crispy Garlic. The Wagyu was cooked to a slight medium-rare and topped with fried garlic and a very light sauce just to enhance the aromatics of the beef. To be honest, I preferred the sashimi here at Sushi Jiro as compared to the beef! 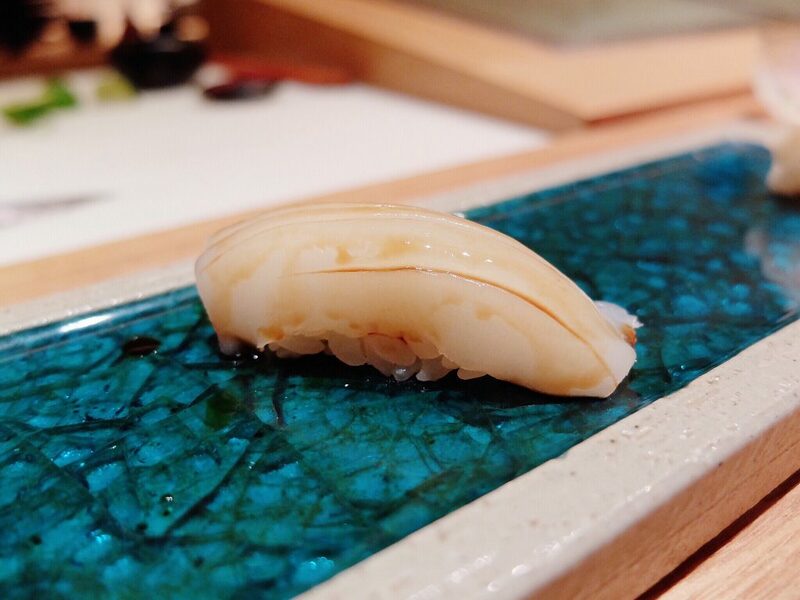 Then came our 9th course, we were extremely fortunate to have a Nigiri sushi platter which consists of Amberjack, Cuttlefish, Hotate (Japanese Scallop), Japanese Barracuda, Shimaji (YellowJack), and Otoro. Not forgetting, a few pieces of Negitoro Maki which were made with a wonderful but well-balanced mix of tuna, leek and radish. It started with the Kanpaichi (Amberjack) Sushi.. The torch was then brought out and the Japanese Barracuda Sushi was torched in flame! Barracuda is actually a seasonal fish that is best enjoyed during the September to November period. 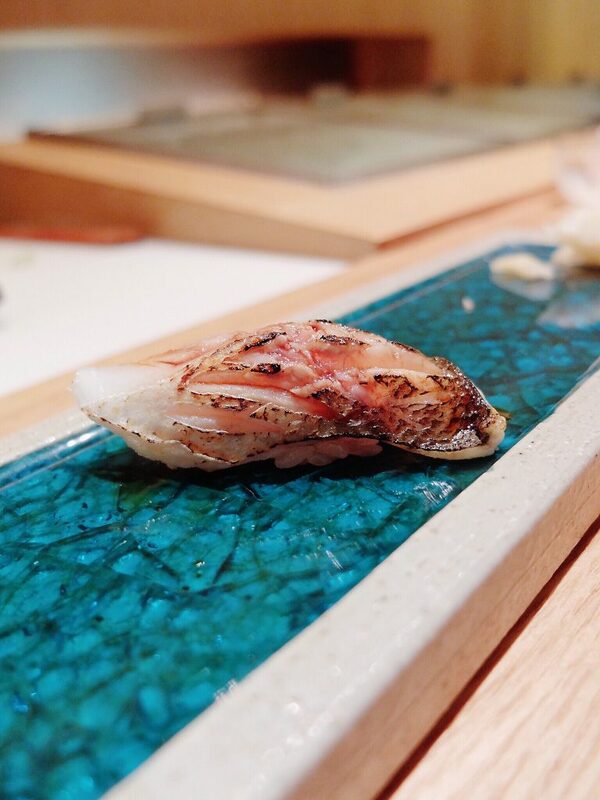 The skin is lightly seared in a very quick Aburi style flame to enhance the flavour and also fill the room with a scent of appetite! 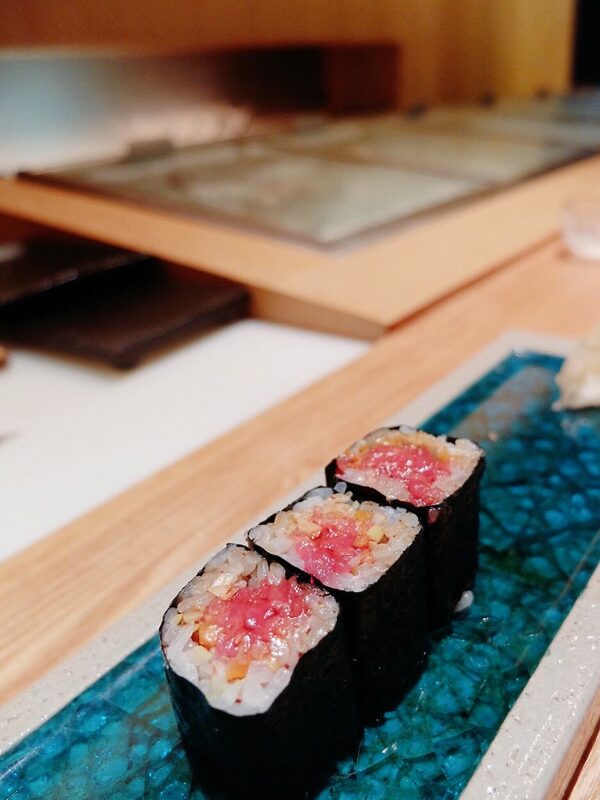 Trust Chef Kenji to turn hotate into a piece of art on top of a sushi, too! 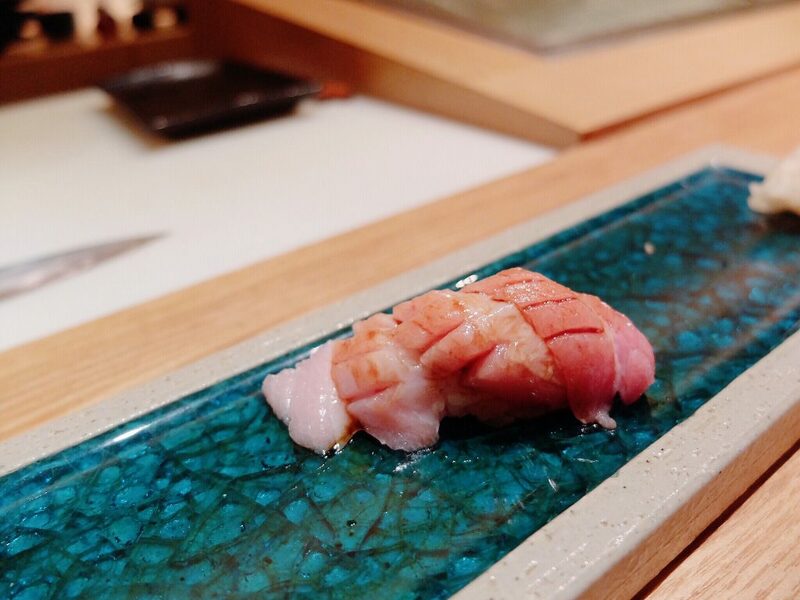 Otoro is actually the most prized and fattiest part of a bluefin tuna. And it usually costs an arm and leg for something of this size, literally. I, of course, gobbled it up within seconds. We were at dish 9 and we were all still so excited! 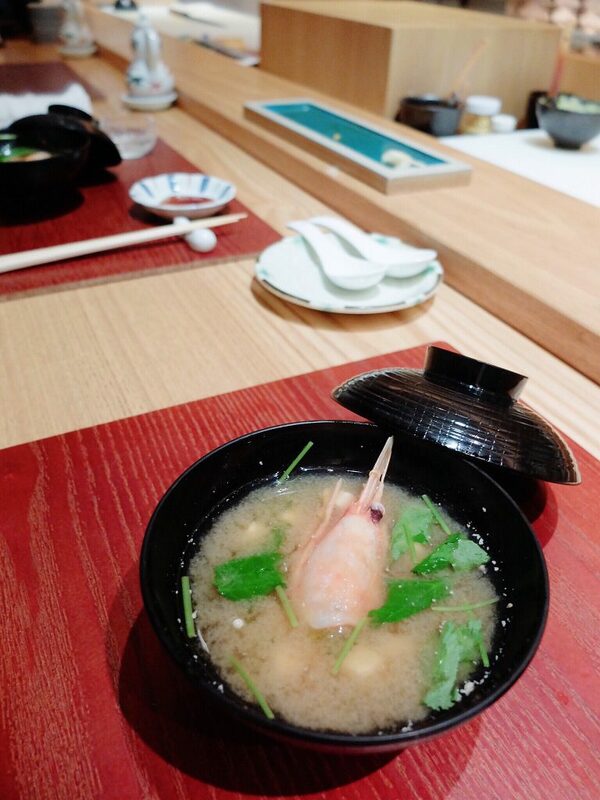 The last and final dish was actually Miso Soup brewed with Prawn Head. It really didn’t taste like your usual Miso Soup because the prawn’s taste was actually covering up the hints of Miso, but it was super enjoyable! Oh, and what’s a Japanese Omakase course without dessert? 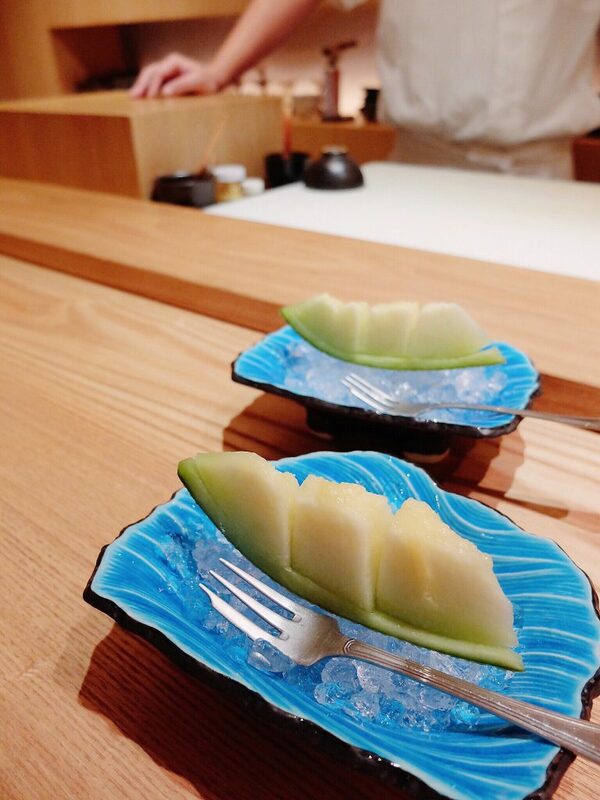 Chef Kenji kindly helped us slice up a sweet rock melon, and we had a few slices to wrap up our meal. 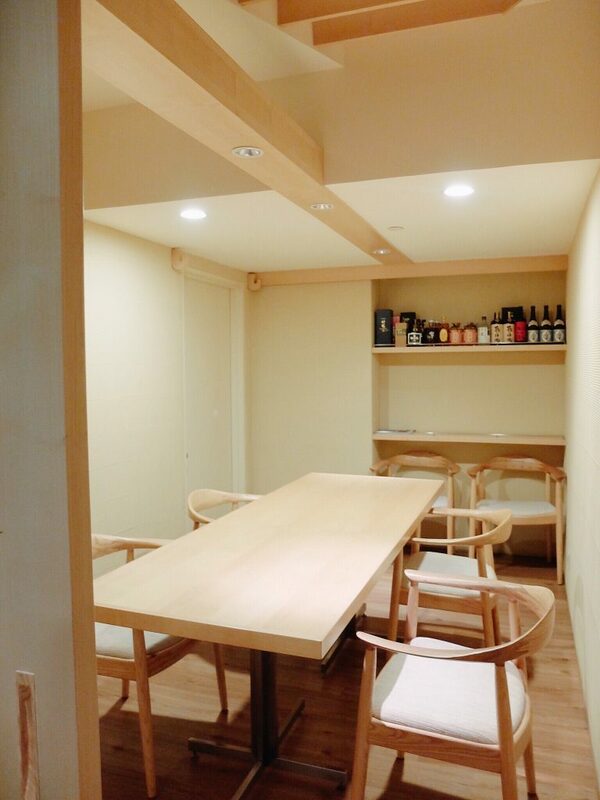 Here’s actually how Sushi Jiro looks like – I like the bar area where I can watch the chef works his/her magic, but if you prefer private dining, Sushi Jiro also has private rooms available! Alcohol-wise, I must say that their pricing is really very reasonable especially when comparing to other high-end restaurants. 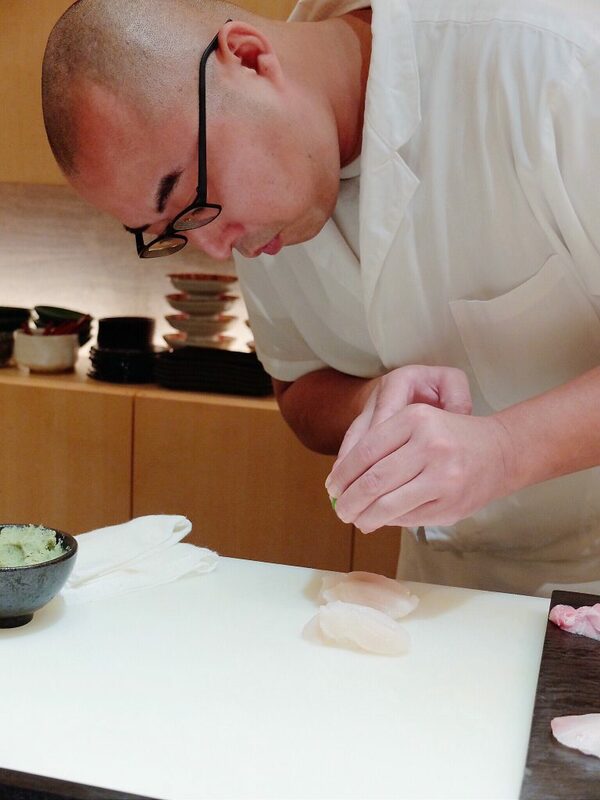 Remember, in Omakase every dish is custom designed to by the chef on-the-fly to suit your appetite perfectly. 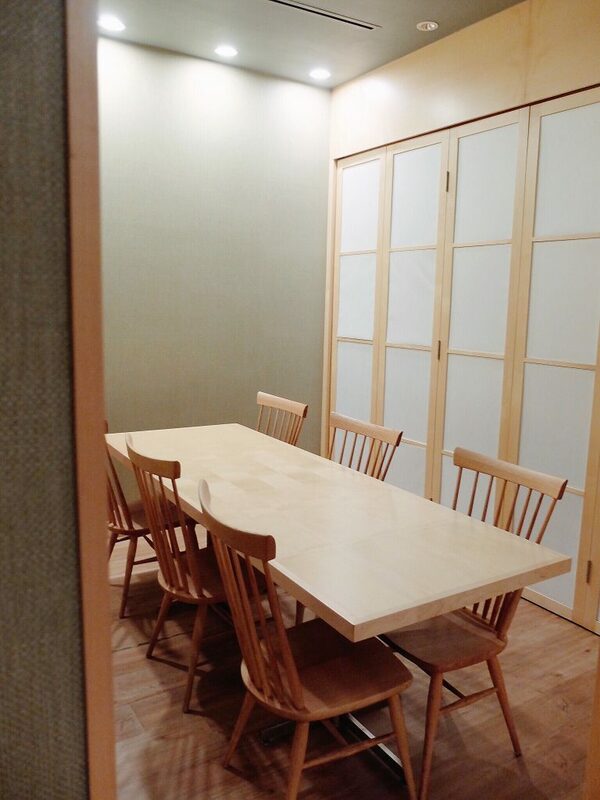 The Private Rooms that Sushi Jiro has can be also combined into 1 big room for a large gathering or business lunch! ..and I’ll definitely be coming back! 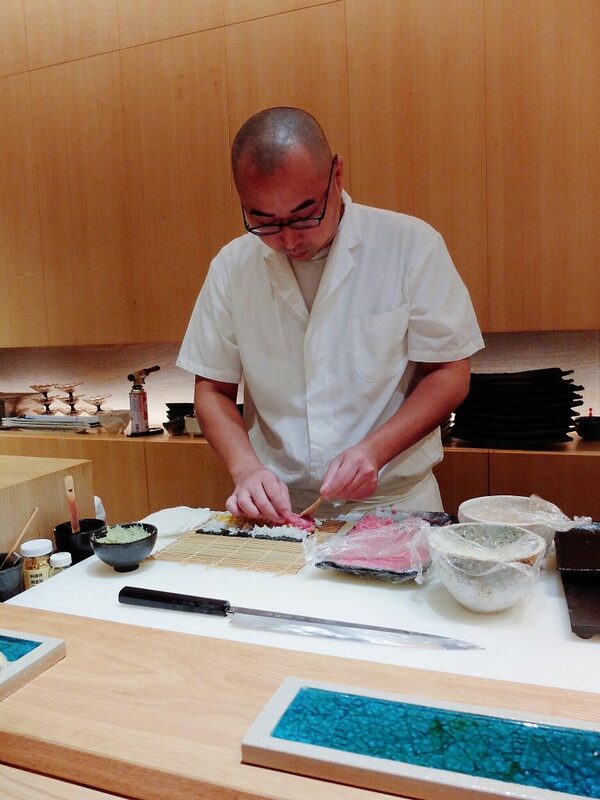 Once again, thank you to the Sushi Jiro team, and especially Chef Kenji for the invite. This was an extremely eye-opening meal with so much delicacies that I actually crave for more!